Click on the image to see full size. It is quite large, so may take a moment to load. 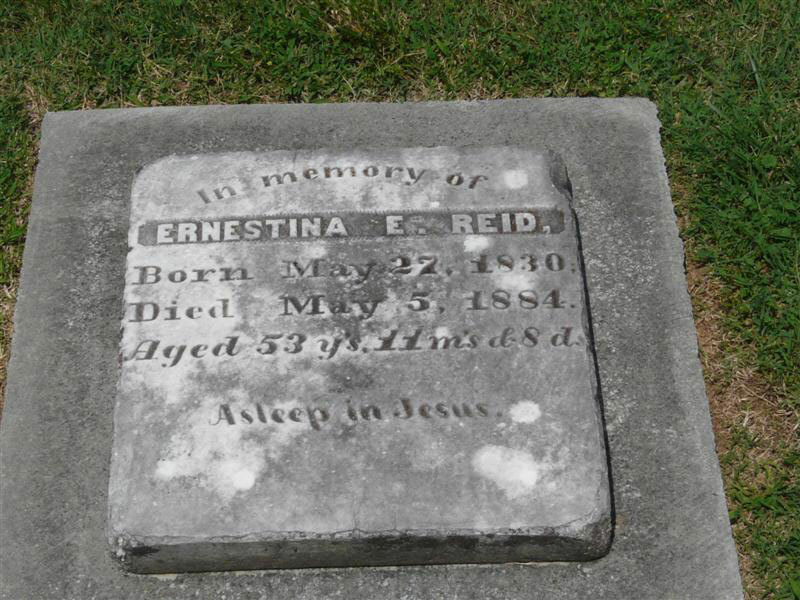 In the early 1880s, Harrison and Ernistina Reid, both in their 50s, lived on their farm southeast of the towns of Winston and Salem, in Waughtown near where the Bowman Gray Stadium now stands. They were known as hard working, yet gentle and decent people. There were a couple of spots on their farm that were perfectly suited to Sunday school picnics. Even though they were members of Friedland Moravian Church, those picnic spots were open to Sunday schools of other denominations as well. Three of their six children were still living, and all of them lived and worked on the farm, as did some of their hired hands. Each morning they all gathered in the Reid’s house for breakfast. 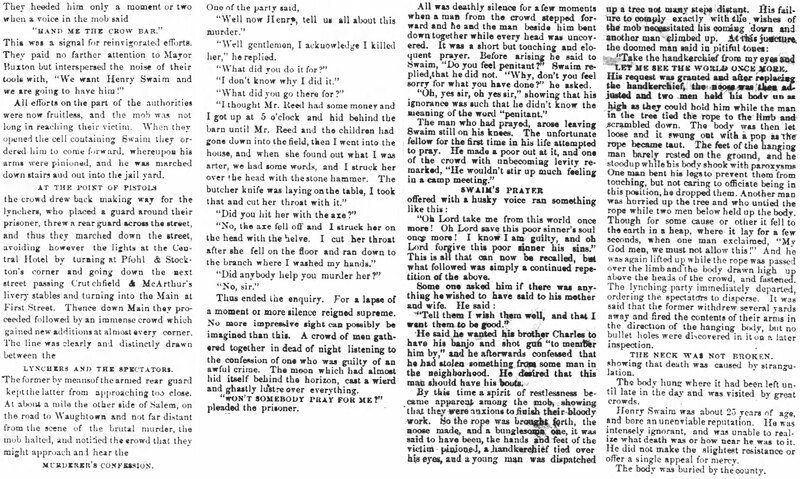 About 6 AM on Monday, May 5, 1884, they finished breakfast and headed out to the corn fields…daughters Sarah and Martha and young Cicero, aged 15…along with the mother and wife of one of their tenenats, Henry Swaim…leaving Ernistina, called Anna by everyone, to clean up and begin working on lunch. Once everyone had their day’s task in hand, Harrison left on a special mission. Hawks had been wreaking havoc on his chickens. He was determined to find their nest and destroy it. As he circled back toward the house, he thought he heard a child screaming. But as he came closer to the house, he recognized the voice as that of his wife Anna, so headed directly for the house. As he came through the barnyard gate, he saw Anna stumbling toward him, covered with blood. Racing to embrace her, he asked “Who did this?” “Henry Swaim.” She whispered it three times, then collapsed into his arms. He carried her to the house, where she died almost instantly. Word spread quickly and neighbors began gathering at the Reid house. Soon the sheriff, Augustus Fogle, and the coroner, William Barrow, were on the scene. As Barrow began organizing the coroner’s inquest, Sheriff Fogle began organizing a posse. They knew who they were looking for. 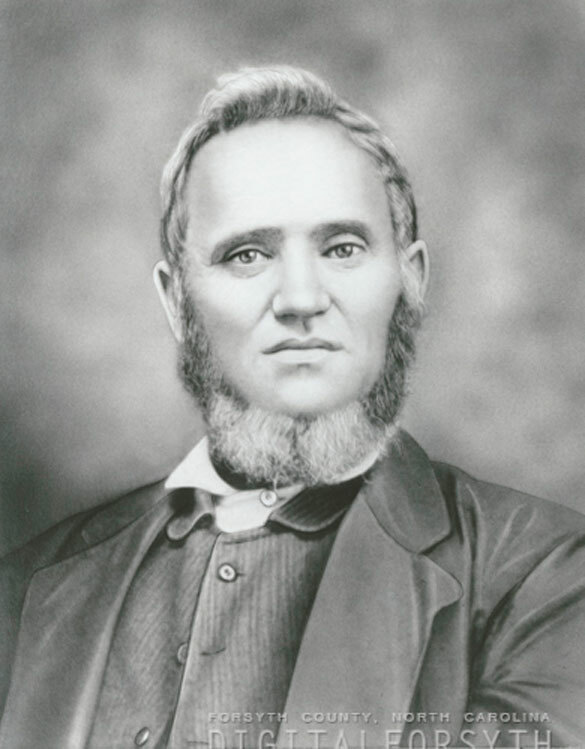 Augustus Fogle, easily one of the most interesting people who ever lived in our city, was a Salem resident, a furniture maker, specializing in church pulpits. He served as sheriff of Forsyth County from 1878-1884 and as as mayor of Salem 1868-73, 1876-78, and 1888-89, as well as a justice of the peace and coroner of Forsyth County. He was buried in the Salem God’s Acre in a coffin that he made for himself. Henry Swaim, about 21-24 years old, was one of the hired hands who lived on the Reid farm. Originally from Guilford County and considered to be something of a simpleton, he had married a woman “of bad character” and had been working for the Reids for about a year. He and his mother and his wife lived in a small dwelling on the Reid farm. The sheriff divided his posse up into groups of three or four and sent them out to find Henry Swaim. Henry was traced “through the orchard and to a branch where he washed the blood from his hands.” Throughout the morning, the usual reports came in. Henry Swaim had been seen here. He had been seen there. He had even been seen in downtown Winston buying a gun. After further medical examination, the jury would later amend its report to state that the carotid artery had not been severed. John McQuiston (not McChristian), a teacher at the Salem boys school, and William Fiddler, who worked for C.F. Nissen in Waughtown, later stated that they sat there in the field on their horses and debated whether or not to string Henry Swaim up on the spot, ultimately deciding to turn him over to Sheriff Fogle instead. That afternoon, Henry Swaim’s mother and his wife visited him in the county jail. He told them that he had nothing to do with the death of Anna Reid. 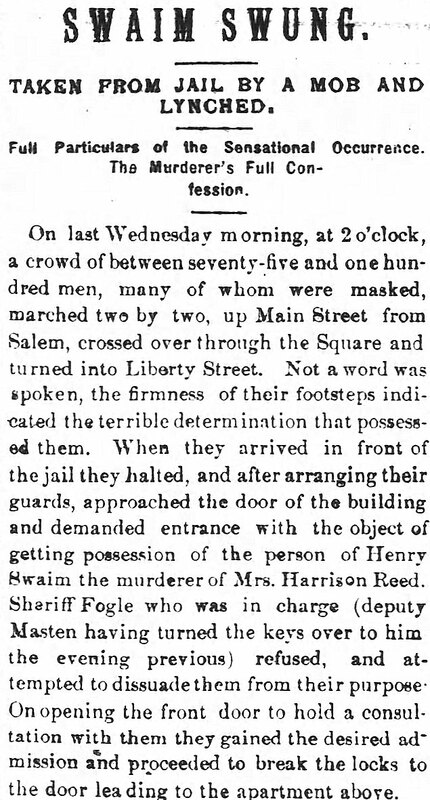 But the authorities in Winston were well aware that there was strong feeling against Henry Swaim, so ordered that extra guards be posted at the county jail. About 2 AM, a crowd of 80 or so masked, heavily armed men came from Waughtown up through Salem and into Winston. 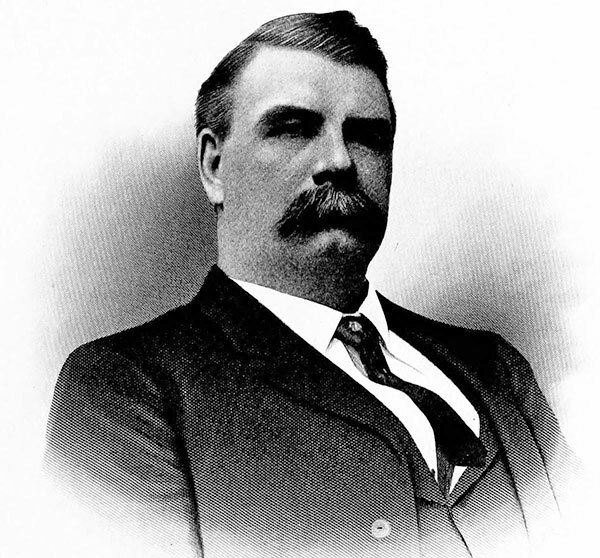 Mayor John Cameron Buxton was summoned. He pleaded with the mob to disperse, but they soon shouted him down and moved on toward the jail. Winston Police Chief W.G. Bahnson then tried too intervene, but the mob ignored him. John Cameron Buxton was born in Asheville, but moved to Winston after finishing law training. He was a founder of the Winston school system, which he served as chairman of the board of education for 26 years. He also served the community as mayor and state senator. When he died in 1916, his funeral became the biggest in the history of the city, conducted by five ministers from five different churches and attended by over 5,000 people in Salem Cemetery. At that point, Sheriff Fogle opened the outer door of the jail to address the mob, but they rushed past him and attacked the inner iron door with crowbars and hammers, beating off the locks. They dragged Henry Swaim out of the jail, tied his arms and marched him back down through Salem and up the hill to Waughtown. No one interfered. “Did you kill Mrs. Reed? I don’t know; I wanted money. Where were you from 5 o’clock that morning until you committed the murder? What was you there for? I wanted to see when they all left the house. Where did you first strike Mrs. Reed? In the house with the stone hammer. How many times did you strike her? Did you hit her with the axe? No, the axe flew off and I struck with the handle. I cut her after she fell and ran down in the direction of the branch where I washed my hands. “The details are horrible throughout — the murder and the lynching. Both are afflictions that this community has never been called upon to endure before. Note: The Reid name is misspelled “Reed” in all contemporary newspaper accounts. When we first posted this story, the facts were as presented by two of the the three local weekly newspapers. We have microfilm for the third paper, the Western Sentinel, but it has many big gaps, and we were unable to find its coverage of the lynching. A few days ago, I found a new source for the Western Sentinel, which provides their coverage of the lynching. The Western Sentinel, founded in Winston in the 1850s, was a secessionist paper, which after the Civil War, became the voice of the conservative Democratic party, eventually leading to the establishment of Jim Crow. They were always the most passionate and dramatic of the local newspapers. Their account of the lynching is far more detailed and drama filled than that of the other two newspapers, yet it has a far stronger ring of truth than the others. At this point, Mayor Buxton arrived and addressed the drunken mob, arguing for reason. He explained that under existing North Carolina law, Henry Swaim was certain to be sentenced to hang for the murder of Anna Reid. But the mob was far beyond reason. For anyone who thinks that lynching was some sort of justice, the above account shows what really happened when a bunch of low intelligence yahoos got drunk, put on masks and went out to circumvent due process. This happened almost daily for many decades in US history, in the South, the Midwest, and elsewhere. Forsyth County is fortunate in that this is the only known instance of lynching in our history. And the Western Sentinel stayed on top of this story for some time to come. They reported that local residents found other routes to pass the lynching site at night for fear of encountering Henry Swaim’s ghost. They reported that a certain person, whose name I will not mention here, made a crayon drawing of Henry Swaim hanging from the tree, which became a major attraction at a certain store in Union Cross. They reported that a certain citizen purchased the property beneath the hanging tree and built a house there. And they reported that, a few years after the event, Henry Swaim’s widow was living in that house. Anyone who thinks that fiction surpasses reality is not really paying attention.